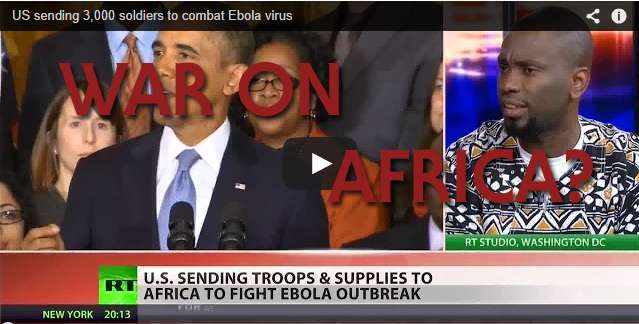 Home » featured » Liberia » newswire » world » Why is the U.S Sending Troops Instead of Doctors to West Africa? Why is the U.S Sending Troops Instead of Doctors to West Africa? President Barack Obama is deploying nearly 3,000 military personnel to West Africa to combat the spread of the Ebola virus. The potentially deadly disease has so far claimed the lives of over 2,400 people, prompting world leaders to pledge material support for the countries most affected. Some are not pleased with the US’ response, however, saying that Africa needs more doctors and not more soldiers. RT’s Ameera David discusses this with Kambale Musavuli, a consultant with Thoughtworks.